That is what Heidi Sarver wrote. Earlier this summer, I did my annual Drum Major Academy tour … ten days full of helping high school folks try to figure out that whole high school band peer leadership thing. Ten days’ worth, also, of hanging out with a staff full of people whose teaching chops I hope one day to emulate. Social media has turned out to be an easy way to see how everybody’s doing, as the fall marching season kicks into gear. Lots of photos have been posted online, of DMA students (and collegiates) in full drum major regalia for their first performance, or in an Ellen DeGeneres-style selfie on a band bus … and, this particular summer, there were lots of video clips of whole bands accepting the Ice Bucket Challenge. As it turns out, a lot of these folks aren’t just good conductors and teachers … they’re pretty expressive writers, too. Anywhere from very funny remarks about how nervous they are about Show #1, to very sweet thoughts about how much they love their bands following pre-season camp … some are Tweet-length, and others involve paragraph indents. It’s been instructive. This week, though, a lot of the folks who experienced the George N. Parks Drum Major Academy took a moment to post thoughts about its founder, on the fourth anniversary of his passing. Mostly, they were appreciating things they’d learned and how they were already able to utilize them in their jobs as drum majors. A testament, no doubt, to the people who have now taken up the DMA instruction responsibilities that Mr. Parks had assumed, for all those years – the lead clinicians who show the students our version of the about-face, who dole out the Starred Thoughts, who wonder who’s going to win the marchoff (“or will it be a rookiiiiiiieeee?…”), who command the kids, “detail: wash the dishes!” in front of their parents on the final DMA day … the folks who “really make it happen”. Here’s what strikes me about all these thoughts: the people who wrote them had never met the guy. Video clips, yes. The particular cadence of a marching command or a GNP turn of phrase that DMA staff members use, themselves, without even thinking about it? Yes. … But in person? No. Never met him. Okay, that’s a legacy. If the man had ever harbored any doubts about that … well, he shouldn’t have. 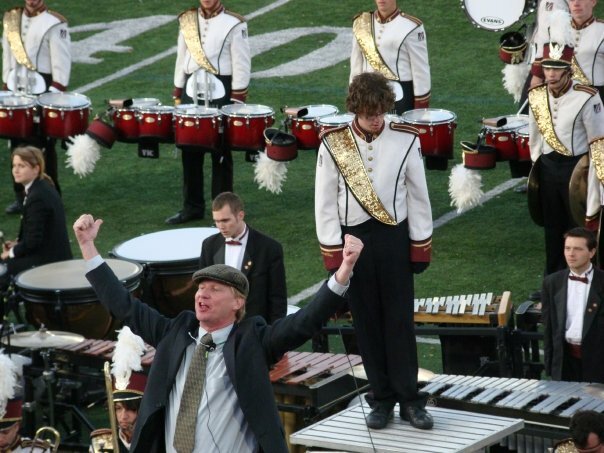 So, as my Facebook news feed has been making unequivocally and poignantly obvious for the last twenty-four hours or so … the membership of the UMass marching band community is marking the fourth anniversary of the passing of George Parks. That community, the group that is paying its proper respects, includes UMassers from the present, from the recent past, from the more distant past, and, as I’ll write about shortly, possibly from the future. Last year, along with the appropriately somber tone, I noticed a distinct air of goofiness – lots of stories were recounted that emphasized the fun and humorous times we experienced with Mr. Parks (and by the way, thirty years removed from my freshman-year band camp, that’s still what I’m most comfortable calling him) – or that we experienced as a result of his assembling us, in various combinations, over the years since. Not so much, this year. Not sure if this is because we’ve calculated that it’s been a full presidential administration, a full Olympic hiatus, since we lost him … or, for some of us, maybe it’s the calculation that the marchers who were in the UMass band during that scary Michigan weekend four years ago are all Out In The Big World now … or what … but something has made a lot of people very quiet and pensive. “Quiet and pensive” is not necessarily the dominant impression that you got from George Parks if you saw him in performance, whether you were a band show audience member, or you were a DMA student, or you were playing touch football with him on the quad in front of Old Chapel. … wherever I read that word, I hear my internal monologue speaking it in Mr. Parks’ voice. At the top of his voice. Once, early in my time as a UMasser, my parents supposed that if you could harness his energy, you could power a small town for a long time. Yes, if you were in the right place at the right time, you might witness a snippet of evidence that in fact, Mr. Parks was not that intense performer all the time. He was a human being with just the same moments of quiet and tired and thinking it over as anyone else … but when he was in public, and on stage in whatever form, he was ON and you were inspired, challenged, to rise to his level of ON. Quite a long time ago, I overheard a couple of people having a conversation, and I don’t remember exactly where or in what context it occurred, but I do know that it didn’t involve anyone I know especially well. The subject was marching band shows, and one side of the conversation made reference to Mr. Parks: “yeah, he’ll get up on the podium and conduct. He’s got three drum majors who can conduct just fine; but he takes one of the tunes and conducts it himself.” The implication was clear – is he that full of himself that he has to be seen leading the band? I understood that these folks weren’t UMass band members – well obviously! – and I also was aware that it’s true: the majority of high school and college band directors leave the conducting of field show performances to their drum majors (the better to get up high in the stands and assess what’s going on, so as to plan the next rehearsal). Have you seen that guy conduct, though? When we were on the field behind him (and, in later years, as band alumni who wished our knees were in better shape, so we could still be out there), we knew Mr. Parks was a focus for the audience’s applause, and we knew very well that he saw himself as a conduit – thank you for applauding for the great band kids behind me who just melted your faces! In this world full of ego, and self-promotion, and utter lack of shame … it’s easy to see how some people might think such a conductor was taking that applause all for himself. After all, there are all those jokes and true stories about maniacal orchestra conductors who ruled their groups with iron fists but happily caught all the thrown bouquets, yes? And then, very recently, I saw this photo of Mr. Parks at the end of a tune, having thrown his hands in the air and looked at the crowd with a look of I dare you not to go crazy. And I realized that it was the image I’d been looking for, the image which described perfectly what was really going on. Look carefully at his hands. They’re not fists. Well, they mostly are … but look at those thumbs. They’re pointing at his kids. And they always were. We’re his kids. And we always were. Death seems to come in threes, they say. I find that so, occasionally, do other things. In the last couple of weeks, I’ve discovered three opportunities to respond to a current event in the same way – namely, the act of consumer activism named after Irish land agent Captain Charles Boycott. But in one case, I’m going to find it difficult. But necessary. But difficult. Event 1: On August 26, Burger King Worldwide merged with the Canadian multinational restaurant chain Tim Hortons to create the world’s third largest fast-food restaurant company. The new company is headquartered in Canada, which means that plans to move its corporate headquarters to Canada. One benefit of this move for Burger King is that the corporate tax rate in Canada is considerably less than that in the US. Many economic activists immediately called for a boycott of Burger King restaurants. Their point: yet another corporation goes overseas (or in this case, over the border) to avoid paying American taxes, while still enjoying all the benefits of doing business in a nation that seems unable to uncouple itself from fast-food consumption. All right, I said, I agree with ya. Corporate greed, and all that. Boycott BK! Do it now! Problem: my own personal Burger King consumption totals about six onion rings a year. So, not much economic impact results from me walking away. Nonetheless, power to the people, and all that. Event 2: On September 8, during a segment of the Fox News Channel’s morning news talk show, “Fox & Friends”, the producers ran the TMZ-released video of former Baltimore Ravens running back Ray Rice punching his wife Jamay in an elevator (a blow which left her unconscious). The release of this video had led to Rice’s being cut from the Ravens, and suspended indefinitely by the National Football League. “Friends” co-host Brian Kilmeade joked … which was the first big problem, but I shall continue … Brian Kilmeade joked, “I think the message is, take the stairs.” He was suggesting that Rice’s wife would have been wiser to be in a place where her husband could not punch her. Or something like that, I presume. Co-host Steve Doocy followed up with his own punchline, so to speak: “The message is, when you’re in an elevator, there’s a camera.” As in, if you’re going to beat your wife, do it somewhere where there isn’t a camera to record your actions and get you in trouble. Be smart about it, man. So, the stairs might turn out to be an option, right, Steve? Just prior to those remarks, the two television personalities had compared the incident to other instances of domestic violence among famous persons, but really seemed intent on assigning blame to the abused, at least as much as to the abuser. Rice’s wife “still married him” after the incident that had been caught on the surveillance recording, Doocy noted, when the couple was merely engaged. “Rihanna went back to Chris Brown right after [he assaulted her]; a lot of people thought that was a terrible message,” Kilmeade pointed out. Let’s also set aside momentarily the fact that when I see and hear either of these two television talking heads working on Fox News Channel, I am reminded less of journalists and more of bags of hammers and boxes of rocks. For those two moments by themselves, I feel it’s appropriate to boycott Fox News. Problem: I don’t watch them anyway. I have a hard time watching them for more than about 30 seconds before feeling like I need to change the channel in order to feel clean again. Either that or it’s amateur hour over there, and our local cable-access channel folks have their acts somewhat together by comparison. Losing my single-person viewership isn’t going to change Fox News’ lives; and not watching them isn’t going to change mine. Event 3: … is Event 2 again. TMZ released video that showed Ray Rice knocking his wife out during an argument that occurred some time ago. Shortly after the video went public, the Baltimore Ravens terminated Rice’s contract and the National Football League suspended him indefinitely. “We begin tonight with the unavoidable and simple truth that, intentionally or by neglect, the Atlantic County district attorney’s office, the Baltimore Ravens, the National Football League and Roger Goodell conducted a cover-up of Ray Rice’s brutal assault on his then fiancee on February 15. There is no other conclusion possible. I am in complete agreement. A number of people have written online about boycotting the whole enterprise. I love watching those New England Patriots, especially since the team acquired management that knew how to assemble and coach a professional athletic team in ways that make it something other than a laughingstock. Maybe their ownership and management will make a statement distancing themselves from their league officials, criticizing their priorities, repudiating their tepid response to this important issue. Maybe. I’m not holding my breath. Admittedly, in this space, I did chronicle a great deal of my worry about the long-term and permanent effects of head injuries on the participants in this fast and brutal sport. And yet, this past weekend, I took a look at parts of at least three week-one NFL games on network TV and, I am embarrassed to report, did not once even think the phrase “oh, head injuries, ow ow owww”, let alone speak it aloud. But this, I think, is different. In both these cases – the concussion issue, and the domestic-abuse issue – the NFL has been shown to have acted in the interest of the maintenance of its own brand and with the awareness of its own financial status, and not in the interest of human decency and social justice. I thought perhaps the head-injury kerfuffle at the end of last season might be the thing that eventually brings this league down. I think I’m probably wrong. I hope someday I turn out to be wrong about that. Turns out I was wrong about one part of that. At least in my case, I don’t think it’ll take work.